Here is the LE blue dial version! Fikk and WatchDialOrange like this. Fikk, yankeexpress and WatchDialOrange like this. Question to all you prodiver owners - what's your favourite strap or way to wear your prodiver? I just purchased a LE blue prodiver and am loving the bracelet. I don't find the stock rubber very comfortable. Tried it on quick with a couple 20mm straps I had lying around (isofrane-style blue borealis strap and a brown RAF strap) and both were pretty nice. I have a navy phenomenato on the way, so that might be the way to go - other suggestions from everyone? Also, anyone other than Brad end up getting one of the new bezels? Good question about the bezels. 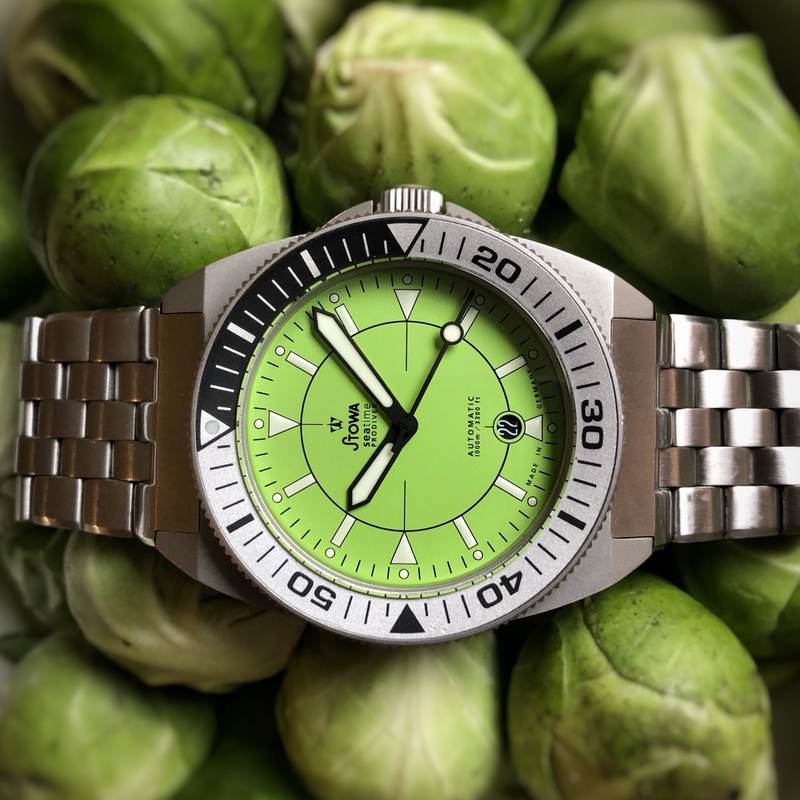 I'm really keen to get a Limette Prodiver (as I mentioned in a different post), and am considering a different bezel to the standard. I think the Titanium would work, however does anybody have any opinions on this combination? I like the Bronze bezel - and it looks amazing on the Blue Prodiver, but don't think this would work with Limette. Brad . your Blue/Bronze looks fantastic. I see you have a Limette too - have you considered pairing this with a different coloured Stowa bezel, and if so, which would work? fire_lantern and Bradjhomes like this. My first Stowa. Brad tells me it's a more uncommon blue dial. I think it's a keeper. Fikk, Dooberfloober, yankeexpress and 1 others like this. Nope. Never thought of trying another bezel on the Limette. I've seen it with the black bezel but that doesn't do it for me. Just got the Ti bracelet in. SteamJ, Fikk, Dooberfloober and 4 others like this. How do you like it compared to the S/S? I think the lines are crisper making it look much better, but I love the weight of the stainless steel package more. 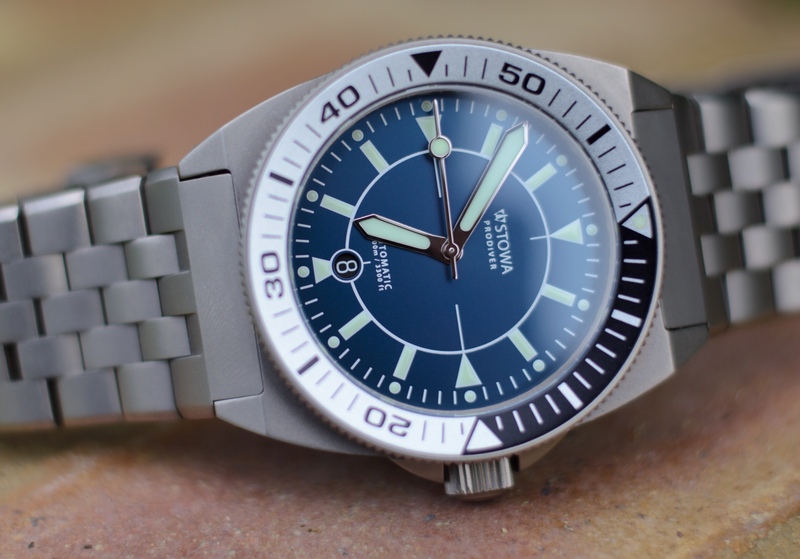 Stowa Prodiver &amp; Stowa Seatime Pictures-Post Them Here! I actually enjoy the lightness of the Ti, which according to my food scale is only 2/3 the weight of the S/S. Otherwise I have a slight preference for the S/S. In particular, the slightly brushed and alternating finishes are a bit more appealing to me than the uniform matte finish of the Ti (which is also a print magnet). And though I suspect tolerances to be near identical, the weight of the S/S bracelet gives the impression of better articulation between the links. Overall, I am happy to own one of each metal. mplsabdullah, SteamJ and Fikk like this.